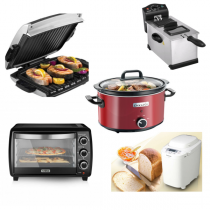 Slow Cookers, Pressure Cookers, Rice Cookers, Deep Fat Fryers, Grills and Sandwich Toasters for sale in our Cardigan shop & online with free local delivery. A wide range of slow cookers, pressure cookers & rice cookers available from leading manufacturers. Looking for a specific product that's not listed? Call us on 01239 613891, lots more available in store and we can order in for you. Free delivery within Ceredigion, Carmarthenshire & Pembrokeshire.